When laying your picture the method of action depends on the adhesives being used. If you intend to use a contact glue such as Thixofix, then refer to the makers instructions (beware of the lumps!!!) and don't forget, you only get one chance with a contact adhesive. It's best kept for big items that cannot be pressed such as larger chess boards. However, if you want to lay your own marquetry picture with PVA, or indeed any other waterbased or two part glue, then there will be some need for pressing. The very simplest method of pressing is to stand or sit on it or use a pile of heavy books, however at the recommended pressure of 15-30 psi, a 10" x 8" picture will require about half a ton! That's a big person or a lotta books!!!! Sufficient weight can be achieved by making a sandwich between boards and driving a car wheel onto it but beware of slippage from the wet glue. Remember that you must achieve an even, heavy pressure and so there is no better way than a properly constructed press. Some very successful presses have been made with old car jacks of either the scissors type or hydraulic. For small items, a vice or series of G clamps works very well. As pressure is put onto the veneer lay-on, some glue can tend to come through the gaps in your marquetry. Protect your picture from damage by putting a sheet of plastic (such as plain plastic or a cut open bin bag) between the marquetry and whatever you put on it to press it down. If you cut open a carrier bag don’t use the printed side in contact with your work! If the glue seeps through, and sets, you may find your best dictionary stuck to your baseboard, with a marquetry picture in between. Trying to prise these apart will damage your dictionary, your picture and your feelings! In fact the best way of using PVA glue is to put the glue on the baseboard only (never on the veneer) and allow to dry for 5-10 minutes before placing the veneer in position. By this time most of the water in the glue will have soaked into the baseboard leaving the glue very sticky but not dry. In this condition there will be little passage of the glue through the veneer, least tendency for the veneer lay-on to slip and the minimum buckling of the veneer due to water soaking into it. Please remember that even if you put a heavy board on top to spread the pressure, there will still be ‘light spots’ of low pressure so if you have a large picture, either weight it evenly, or keep weight moving. The golden rule in gluing down is to check the work for blisters after say 15-20 minutes, and if present, to remove with a warm domestic iron. Once the glue has set a recalcitrant bubble takes a lot more work to lose. If you are pressing regularly, you may want to bring some mechanisation into the job. If you do feel the urge, then there are a number of possibilities. 1. The Car Jack. 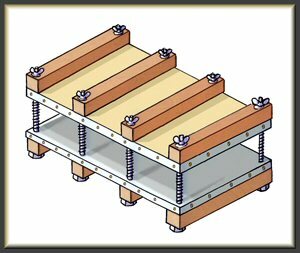 Ernie Ives, of the Marquetry Society, has a fiendish plan with a car jack, inside an angle-ironed frame. The push of the jack provides the pressure. 2. 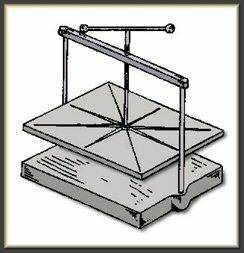 A Screw Press: We use them to lay the marquetry pictures, see diagram. Tremendous pressure can be built up under one of these presses, and they do the job very well. If you are thinking of making one for yourself think carefully, as they do need to be very robustly made, otherwise the forces involved will bend and bow everything in sight! 3 The ultimate is a Bag Press, which uses air pressure, or vacuum, to hold the veneer down while the glue sets. If you are the proud possessor of one of these, you are indeed lucky. One last word of advice - as the glueline can tend to be slippery, the lay-on has been known to slip between gluing it down and the glue setting. Again, do check everything before the glue sets hard - nothing is more upsetting than the find the whole thing looking crooked.